Sekine Nobuo is an artist. 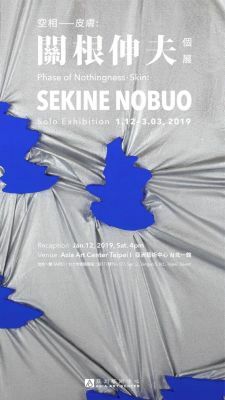 Asia Art Center is pleased to present "Phase of Nothingness - Skin: SEKINE Nobuo Solo Exhibition" opening on Jan. 12, 2019. The exhibition will be held at Asia Art Center Taipei I, featuring twenty of the newest compositions and selected artist's drawings created since 2016. The exhibition will open on Jan. 12, 2019 (Sat.) 4pm; and it will be on view till Mar. 3, 2019. Mono-ha was founded by Sekine Nobuo along with numerous Japanese and Korean artists between 1968-1970, and is now regarded as one of the most iconic modern art movements in post-war Japan. The movement has been championed for its inauguration of a uniquely Asian art form, manifested through the revitalization of Eastern philosophy in respect to its critique on Western culture. Born in Saitama Prefecture in 1942, Sekine Nobuo received his B.F.A. in Painting from Tama University of Arts in 1968; furthermore, he would later compose the groundbreaking work "Phase - Mother Earth" in the same year. With the presentation of this work and its underlying concept, Sekine Nobuo pioneered a new pathing of art expression - the unification between human and nature mediated through concentration of physical substantiality. The composition marked the beginning of Mono-ha, and remains influential to the developments of earth, installation and minimalist art in Asia. The upcoming exhibition by Asia Art Center presents Sekine Nobuo's newest series "Phase of Nothingness - Skin", selected artist's drawings will also be displayed alongside their completed works, providing a comprehensive insight into the artist's creative process. For a half-century, Sekine Nobuo's oeuvre has explored the artistic possibilities of Mono-ha and its ideological root in Zen philosophy. By integrating topological theories (study of the properties of space) into his artistic experimentation, Sekine's art examines the intrinsic quality of matter under different phases of transformation. In topological thinking, a two-dimensional plane is merely a three-dimensional form expanded as broad and thin as possible; therefore, a painting is merely a membrane form of a sculpture. The works subject the audience to visualize various topological phases, provoking them to question the interrelation between the matters and themselves as the transformation takes place. The "Phase of Nothingness - Skin" series perpetuates the three fundamentals of Mono-ha. Firstly, the physical and non-imaginary substantiality discernible upon the wrinkling surface of the works. Secondly, the visualization of time and the natural balance between opposite forces of tension. Lastly, the manifestation of topological phases through the creases and folds on canvas that reflect the spatial waves in the membrane of the universe. Recent cosmology suggests the possibility of contraction of the universe in future (despite the fact it is rapidly expanding ever since the Big Bang). In which case, the elastic canvas of "Phase of Nothingness - Skin" truly is a microcosm of the macrocosm. Each wrinkle and fold records a pinch of the universe. Sekine Nobuo was born in 1942 in Saitama prefecture, Japan. He received B.F.A in Painting at Tama Art University in 1968. He has worked actively as the central figure of Mono-ha in international exhibitions. His compositions range from large-scale earthwork, installation of natural and industrial materials, space-specific life-size sculpture, and flat-surface works that explore the materiality of painting media. Selected Exhibitions: Prima Materia (Punta Della Dogana, Venice, 2013), Tokyo 1955-1970: A New Avant-Garde (Museum of Modern Art, New York, 2012), Reconsidering Mono-ha (The National Museum of Art, Osaka, 2005), Century City (Tate Modern, London, 2001), Phase of Nothingness - Black (Germany, Denmark, Netherlands and Norway, 1978-1979), Phase of Nothingness (35th La Biennale di Venezia, Venice, 1970).